Oh wow. Today I went to Total Wine & More in Pembroke Pines and had a great experience. You may remember that I told you about the cashier on my first time there recommending a Belgian beer, but I didn't understand the name (if not, read the last paragraph here). Well, it was about 50:50 with his accent and the name of the beer. But today the same guy saw me eyeing up the Belgians, and I got a total (wine) lesson. This guy was in love with his job and those beers. He was telling me about a 100-500 rating scale and he knew the rating for every beer on the shelf. And he convinced me to buy his favorite, the one he had recommended to me the first day. That one's for another day (this weekend of course). The cashier today recommended that I use one of their spare boxes so my bottles wouldn't roll around in the car, so I left with a bunch of beer in a Southern Comfort box. BTW, Southern Comfort is on my "Never Again" list, it's actually at the top of that list. And there are not many members of that elite group. Ask if you really want to know that story (this paragraph is getting long). 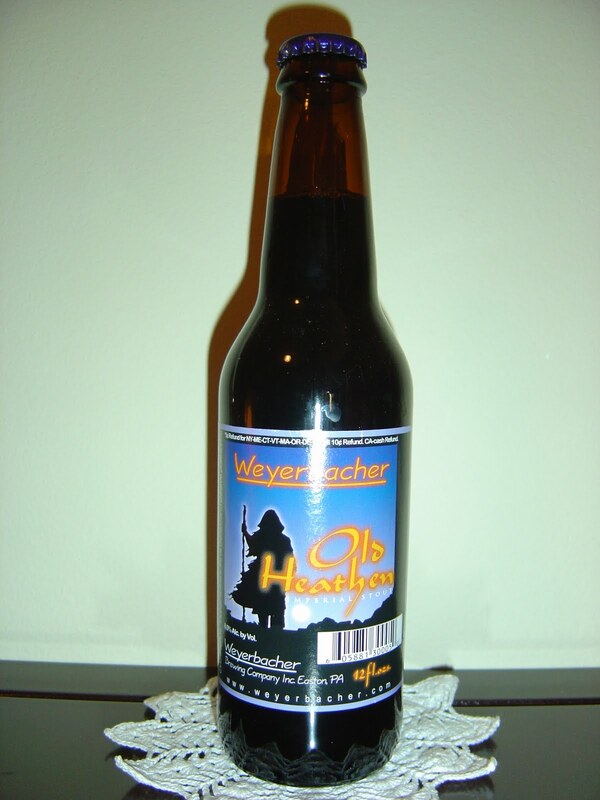 Tonight I am drinking Weyerbacher Old Heathen Imperial Stout brewed by Weyerbacher Brewing Company in Easton, Pennsylvania. You may remember my affinity for Easton--my grandmother lived there all of my childhood and my aunt and uncle still do, Porter's Pub, and some friends too. My father actually used to work out with Larry Holmes back in the day as well--work out as in running for exercise, not as his punching bag. Turned out well too as punching bags do not usually end up as general surgeons. I actually got three beers from this brewery because I've seen so many friends from Beer Valley say this is their favorite brewery. I hope they steered me right. Well, yep they did steer me right. This is an excellent beer. Great milk chocolate aroma and flavors. I can also taste toffee, molasses and vanilla, like an awesome ice cream sundae. Yes it is sweet, but not in a bad way. Mmmmm chocolate and vanilla all rolled into one--surely you've heard of the black and white cookie and its harmony together. This beer is a little flat, and I could've used some more carbonation. It's also not overpowering and reminds me a bit of the Old Plowshare Stout Organic I had last week, at least in that respect, minus any sense of licorice. Past the great beer, what's with the need for breweries to name their Stouts something tough? I mean Old Heathen Imperial Stout? Yeti Imperial Stout? Would it make a difference if the heathen was an infant or the Yeti was actually an abominable snowman? And I'm sure there are many others. Is this a mission to see who has the biggest (watch)? Cool names are fun, but whatever, it's the beer that matters. Update 4/11/2010: More than a year later, here is a picture for you! Better late than never, I guess.